Economic news was strong in October, led by US Q3 GDP coming at an annualised rate of 3.0%. Quarterly earnings and sales for S&P 500 companies are beating estimates by more than usual. One standout was bellwether stock Caterpillar, which after four years of declining revenue has seen sales up sharply this year. It isn’t just the US, global corporate earnings are in something of a sweet spot. The latest inflation data has also been positively received with the UK running at 3.0%, the US at 2.2% and the Eurozone at 1.5%. This is flowing through to consumers with growth in the US labour force sucking back in the unemployed. All of this is good news for investors. The bad news for investors is that markets have run well ahead of this data over the last five years. 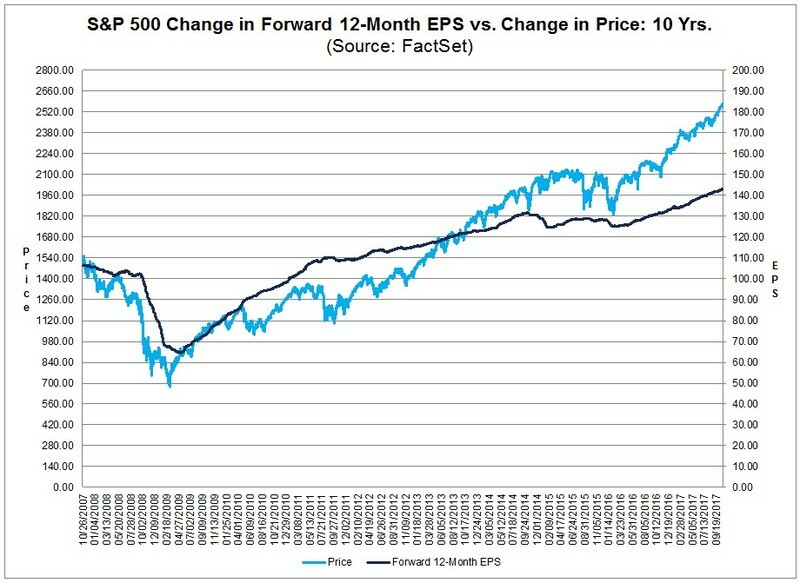 As the graph below from FactSet shows the S&P 500 has risen much faster than the projected earnings growth of its constituents. This isn’t just a US phenomenon, the following graph from Bloomberg tracks the P/E ratio of the MSCI World Index. Equity markets are showing plenty of signs of exuberance, some of which rival the excesses of the tech boom. There’s 28 stocks in the S&P 500 trading at over ten times revenue versus 29 at the peak before the tech wreck. McDonalds has declining revenue and net income but trades at a P/E of 30. Investors aren’t bothered by companies losing more than $1 billion per year, these are amongst the stocks gaining the most. One tech CEO commented that "our valuation and size today are much more based on our energy and spirituality than it is on a multiple of revenue". The American Airlines CEO noted "I don't think we're ever going to lose money again". This positive sentiment was summed up by the Macro Tourist as ”there are no bears left, only gloating bulls”. Noted value manager David Einhorn publicly questioned whether value investing works anymore in a world of money losing start-ups. It’s not just equities that look expensive, almost all risk assets are arguably overvalued. After the tech bubble and the housing bubble, the widespread overvaluation of today is being labelled the everything bubble. A standout for stupidity in debt markets this month was Illinois issuing 11 year debt at a 3.74% yield, a skinny 1.68% above the benchmark. The state is spending 48% of its general revenue on debt and pensions obligations. The comptroller is unclear how much is owed in overdue trade creditors (estimates are over $16 billion) with $650 million a year being accrued in late fees. Frontier markets are having a boom year for issuing debt, so much so that the IMF is temporarily out of a job. Investors aren’t letting fast credit growth and budget deficits in these countries stop them. The US high yield market is hot; dividend recaps are back in a big way and covenant light lending now tops 70% of leveraged loans. Add-backs have also returned with EBITDA inflated by an average of 30% in merger and acquisition loans. The higher volumes are being soaked up by CLOs – this year global CLO issuance is likely to equal the combined issuance of 2006 and 2007. 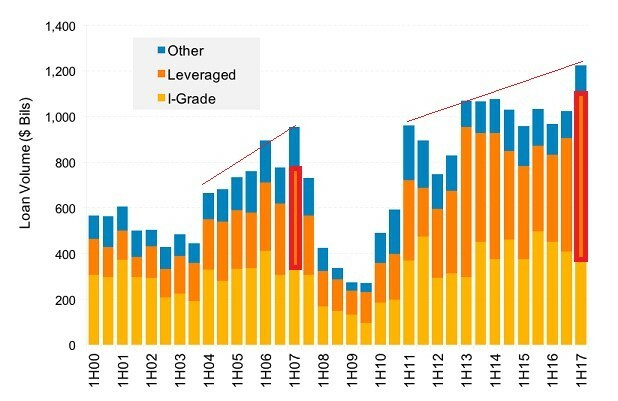 The chart below from ETF Expert sums up the state of the loan market – record volumes with most issuance being below investment grade. European high yield is just as bad, its index is trading at a yield 0.18% less than US 10 year treasuries. The relentless march higher for risk assets has been aided by very low levels of volatility. The S&P 500 is up twelve months and eight quarters in a row. 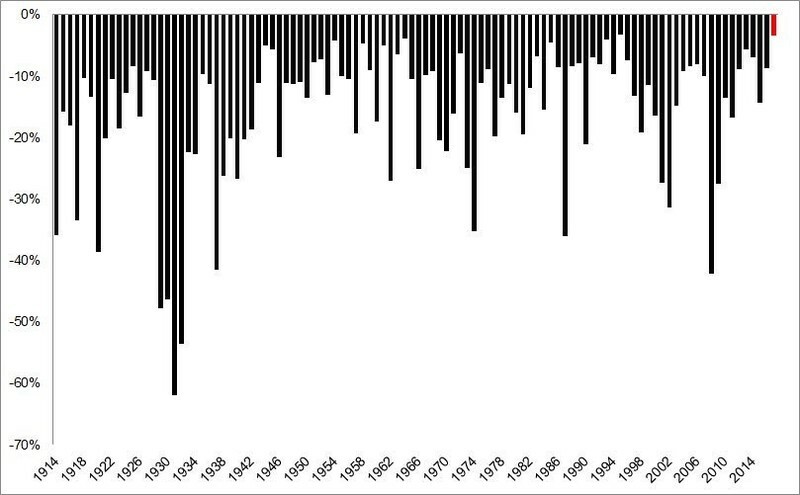 The key index has broken the record for the longest period without a 3% single day drawdown. The graph below from the Irrelevant Investor shows that the S&P 500 is on track to have its smallest ever drawdown in a calendar year. The Dow Jones Industrial Average is running a Sharpe Ratio of 4.5 this year, above 99.7% of prior periods. Q3 had the lowest average reading for the VIX, October’s average was even lower. Hedge funds are holding record positions betting that low volatility will continue – this strategy has been a huge winner in 2017. Several ETFs that bet on higher volatility have lost over 60% of their value this year. The combination of high returns and low volatility could be setting up markets for a nasty pull back that investors aren’t prepared for. By one measure, cash balances are at the lowest percentage of total assets for 27 years. Other risks include US GDP being propped up by consumer spending dependent upon a low savings rate and rising consumer credit. Global quantitative easing could go from $2 trillion in 2017 to zero in 2019 if central bankers follow through on their stated aims. That’s an awful lot of buying power that could be withdrawn. The mostly negative impacts of quantitative easing are increasingly being recognised and are summed up in the graphic below from Algebris. It wouldn’t be fair to talk about overvaluation without mentioning China. The outgoing PBOC Governor explicitly mentioned the potential of a Minsky Moment for China. Here’s a summary of this month’s news that shows why his comment is valid. A sample of 4,000 bonds shows an average net debt to EBITDA ratio of 27. 18% of residential property was bought by government or with government subsidies in 2016, that could grow to 24% this year. There’s anecdotal evidence that young property buyers are committing to loan repayments more than they earn, taking on multiple layers of debt and lying about their incomes. One Belt One Road programs are spending billions in volatile countries with little prospect of positive returns. Chinese banks don’t lend to companies, they just handout subsidies to favoured applicants. Many debt to equity swaps are planned but few are being completed. The ones that have “completed” have mostly been swapping debt for debt with little debt being converted to equity. In a show of how much the government cares about saving face seventeen loss making companies were told to delay earnings announcements until after the Communist Party Congress.